A demonstration of the technique in Sonic 3. Water Running is a technique used in various Sonic games. When moving at top speed, Sonic characters can run along the surface of bodies of water. It appeared as early as Sonic the Hedgehog 3 in Hydrocity Zone, where Sonic, Tails, and even Knuckles could utilize the various loops and drops to gain enough speed to traverse the bodies of water without falling in. 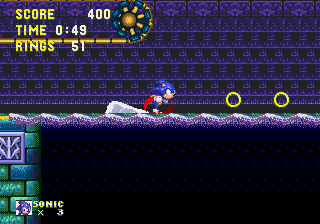 Sonic R allowed running on water with the aid of a Water Shield. Sonic 2 on Game Gear allowed water skipping in Aqua Lake Zone. This technique however, was all but forgotten in many games since. Games from Sonic 3D Blast onward didn't feature any water running, and instead of letting Sonic run on the water the game used water as a hazard and killed any character when it was breached. It lived on in portable titles however. Sonic Rush, Sonic Rush Adventure and Sonic Colours (Nintendo DS) all featured water running in their respective water levels thanks to the Burst Dash. Finally, water running made its grand return to consoles in Sonic Unleashed, where in certain levels like Cool Edge and Adabat, water running was used extensively in the layout of the level. You could still die however by losing enough speed and falling in. This feature returned in Sonic Colours in the stage Aquarium Park, where the water sections were in 2D, making them easier and speedier to traverse, like various older titles did on the Sega Mega Drive. Water Running was kept in Sonic Generations in the same manner as used in those games, where in 3D you could water run and die upon breaking the surface, but in 2D you would live and continue on. This page was last edited on 13 April 2019, at 06:19.